On the 27th of June 2015, Soapbox Science together with a team from Newcastle University will transform the Monument area in Newcastle City Centre into a hub for science and discovery. As female scientists from across the region – and beyond it – take to the streets, get on a soapbox and showcase their science to the public, the aim is simple: bring science and the women doing it to the attention of the general public. Soapbox Science 2015 Newcastle is being coordinated by a team from the Institute for Cell and Molecular Biosciences, Newcastle University, who were enthused after meeting Professor Hilary Lappin-Scott, coordinator of Soapbox Science 2014 Swansea, through our activities to promote equality in science. The event is sponsored by STFC, who also support directly the research of several of our speakers. The NIHR Newcastle Biomedical Research Centre in Ageing & Chronic Disease (BRC) is also supporting the Newcastle Soapbox Science event. The BRC is a partnership between the Newcastle NHS Foundation Trust and Newcastle University delivering a comprehensive research programme aimed at improving healthcare in an expanding ageing population. It capitalises on a strong track record for translational research in Newcastle bringing together multidisciplinary teams to pursue patient-centred research in a wide range of diseases where age is a major risk factor. 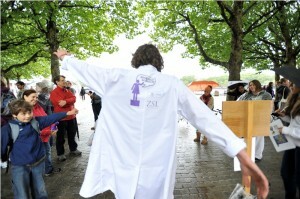 Newcastle Wood Recycling have then generously supplied the soapboxes for the Newcastle Soapbox Science event. Newcastle Wood Recycling is a financially self-supporting social enterprise set up to save resources, create jobs and provide training and volunteering opportunities for local people. They rescue, re-use and recycle waste timber and are part of an award winning network of enterprises striving to reduce waste and make more efficient use of resources’. The Natural Environment Research Council is sponsoring Misses Jessica Duffill Telsnig & Jasmine Black. The Natural Environment Research Council is the UK’s largest funder of independent environmental science, training and innovation, delivered through universities and research centres. Formed by Royal Charter in 1965, the Natural Environment Research Council marks its 50th anniversary in 2015. Throughout NERC’s Summer of Science, NERC researchers (such as Jessica and Jasmine) will be taking their work and enthusiasm out to the public, branching out from the usual science festival venues into shopping centres, music festivals, pubs and even beaches. Immunology North East is sponsoring Dr Rachel Williams. Immunology North East is a regional group of the British Society for Immunology. This group aims to promote discussion and collaboration between all those interested in immunology in the North East of England.